For 19 consecutive years, Watermark has proudly published a full-color wall calendar celebrating active aging and the arts. 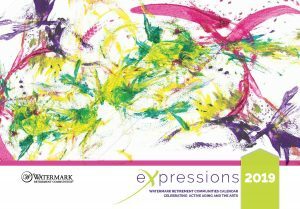 Featuring works submitted by Watermark residents from coast to coast, Expressions 2019 is sure to inspire creativity within everyone it reaches. Complimentary copies of Expressions 2019 are available for the asking while supplies last. Please call or stop by a Watermark community near you to pick up your copy or to inquire for more information about how we’re creating extraordinary and innovative communities where people thrive. » View and download the current calendar in PDF form here.